Amy Long Carrera is a registered dietitian in Los Angeles who has been writing since 2007 for such publications as The Insider, On the Other Side and Arthritis Today. She is a certified nutrition support clinician and her writing employs current research to provide evidence-based nutrition information. Carrera holds a master of science degree in nutrition from California State University, Northridge. Rather than a cause of diarrhea, coconut water is often used to treat this condition. Americans don't get enough potassium, according to the U.S. Department of Agriculture, and coconut water is at the top of the list of potassium-containing foods, providing 13 percent of your daily potassium needs in an 8-ounce serving. The salty beverage is also chock-full of other important electrolytes that can help your body recover from diarrhea. Coconut water is a natural source of water and electrolytes, including potassium, sodium, magnesium, phosphorus and calcium. Coconut water rehydrated study subjects as effectively as a commercial sports drink after an hour of dehydrating exercise. 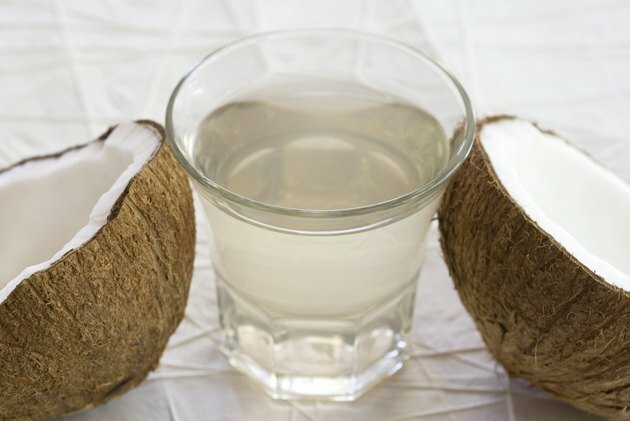 The participants did report more abdominal bloating after drinking the coconut water, but they consumed 2 to 2.5 liters of the liquid -- much more than a typical 8-ounce serving. There was no mention of diarrhea in the study, which was published in the "Journal of the International Society of Sports Nutrition" in 2012. Although coconut water doesn't cause diarrhea, it can help prevent dehydration from it. Replacing depleted fluid and electrolytes, such as potassium and sodium, is often the only treatment for diarrhea, states the National Digestive Diseases Information Clearinghouse. If you don't mind the salty taste, you can use coconut water to prevent dehydration during mild bouts of diarrhea, according to the Berkeley Wellness website. Can Gatorade Help With Constipation? What Drink for Adults Is High in Electrolytes?